This was one of my favorite manicures of the entire year! 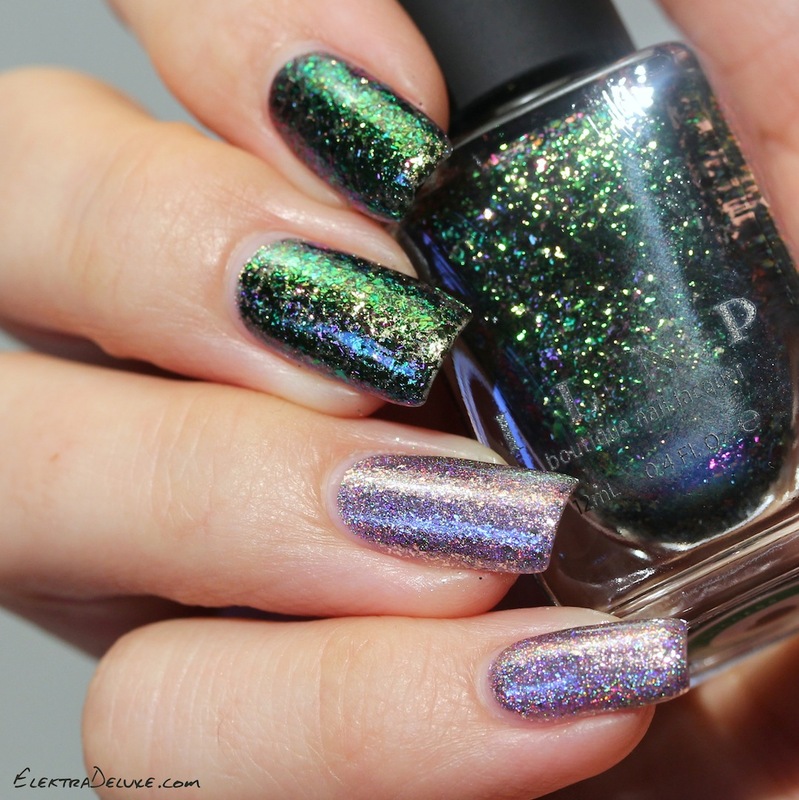 It combines an ultra chrome flakie with a glittery holo. Both polishes are from ILNP. 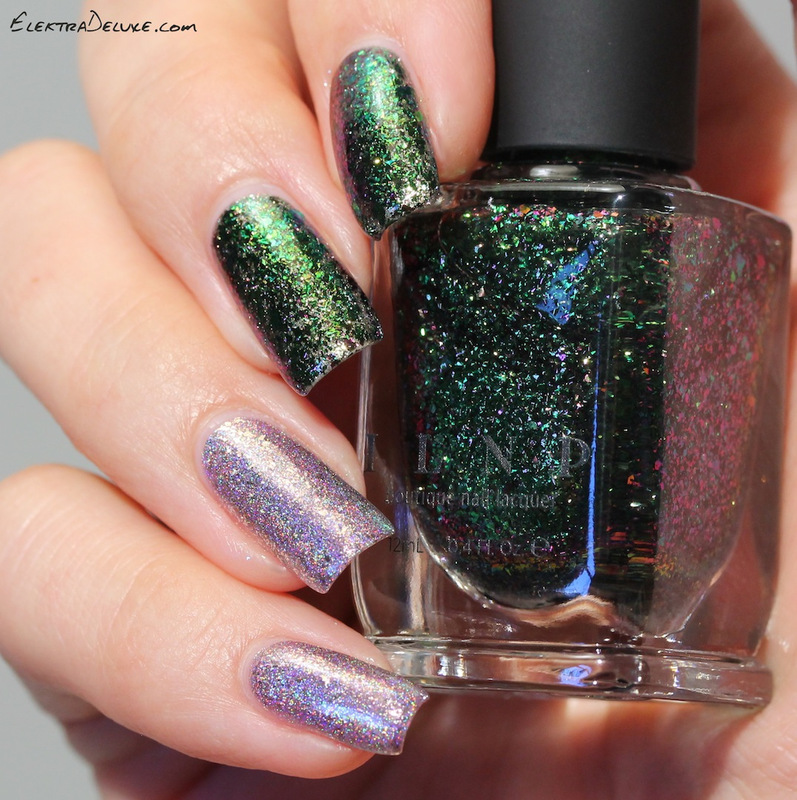 The ultra chrome flakie is ILNP Success, which shifts between green, silver and pink. This particular shade is really special. The dominant color is green, but in the center of the nail the pink prominently peeks through. Love this one! The second polish is the glittery holo ILNP Happily Ever After. It is a soft lilac with holo pigment and silver flakes. ILNP Fame and Money Bin have the same finish. ILNP recently started to call these polishes Ultra Metallics. I started out with 2 coats of Dance Legend Solar Eclipse on index and middle finger. I wanted to have an opaque base before applying the flakies. Then I added 2 coats of ILNP Success. On ring, pinkie and thumb I applied 2 coats of ILNP Happily Ever After. The warm lilac of Happily Ever After really pulled out the pink in Success! Have you already tried one of the ILNP Ultra Metallics? These are really pretty. How do these compare to FUN Lacquers? I haven’t tried either brand.